Someone’s getting married – excitement is in the air! And Hens Party wine tours with Top Gun Tours is a fantastically fun way to celebrate the announcement with all your female besties. We provide you with a decadent, fun experience you’ll all remember for years to come! Whether it’s the main event of the day, or a fun lead-up to the night-time events, we’ll make sure that this hen party is one no one will forget! Sit back, relax, and let us do all the hard work while you celebrate the bride-to-be and shower her with indulgences. Our Hen’s tours operate from 11am-5pm on any chosen day. We do require our hen’s parties to have a minimum number of 12 passengers; otherwise we suggest you view our Swan Valley Wine Tours for less than 12 persons. Our Hen’s Tour is considered a group booking. Cost: $108.00 (AUD) per person, all-inclusive. 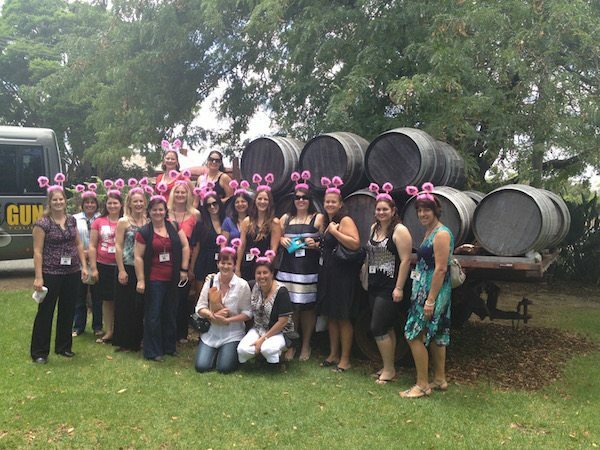 Our Hen’s Party Wine Tours of the Swan Valley offer hen’s parties a unique experience, sure to impress your bride-to-be. On tour, the bride and her girls will experience a generous range of fine wine samples, cheeses, wine-infused sorbet and chocolate tastings from the local area. You’ll visit a winery, followed by wine tasting and lunch, then more wineries and a delicious chocolate stop at the end of the day. At lunchtime, sit and relax while you enjoy a stunning TWO COURSE meal of your choice at Mandoon Estate. You’ll have three fabulous options to choose from (including vegetarian), and you’ll dine in the immaculate Wild Swan restaurant overlooking the manicured gardens and The Llawn below. Your senses will be let loose in the Swan Valley as you enjoy every sip, every indulgent bite, all while taking in the stunning scenery and enjoying the fresh air with your girlfriends. The wonderful scenery makes a perfect setting for fun photos among the vines and wineries. Want more of a twist? Why not theme your hens do by dressing up to add to the fun. You’ll love the luxury and comfort of the Top Gun Tours bus. Your hen party bus ride between wineries, restaurants and chocolate destinations is equipped with the latest in sound technology, compatible with just about any device, complete with high backed seats, and tinted windows, ensuring you arrive in style and comfort at each destination. After your tour is over, your friendly guide will drop you back at Perth City. We handpick all of our tours so you can rest assured that the samples will be generous, the food delicious, and the scenery unforgettable. We’re happy to say, all our hens depart our tours feeling spoilt after their fun-filled adventure! If you’d like to explore the wineries of the Swan Valley in style and luxury, contact the Swan Valley’s Top Gun Tours today. Thoroughly recommend. Top Gun Tours was hired for a bride-to-be wedding party. Our tour guide Matthew provided us with a seamlessly run tour from start to finish. Well chosen wineries, an excellent two course lunch, chocolate factory and a little bit of of interesting & relevant information chipped in. Matthew is well organised, kept the mood upbeat & is very easy to get along with. Thank you Matt for a very enjoyable outing.